The Rosary is a simple and beautiful prayer. Prayer in the singular sense as it is one prayer composed of many smaller prayers. 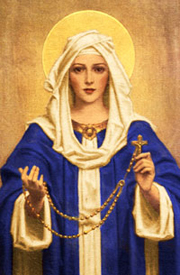 The rosary as we know it today appeared in the late 12th and early 13 century. There were similar methods of prayer that existed before then, when Christians would count 150 Our Fathers in place of reciting the 150 Psalms using corded beads or stones. However, the Rosary as we know it in its most early formulation really does appear out of nowhere. The story of the origin of the Rosary is that the Blessed Mother appeared to St. Dominic and taught him to pray the rosary and instructed him to preach and pray the Holy Rosary so as to convert the hardened hearts of sinners. Composed of four groups of mysteries in which we meditate on the Life of Christ, the four mysteries act as a frame in order to draw out attention to what the frame incases. Just like a picture frame, the frame lets us know that what it contains is important. It is beautiful. It is worthy of respect and a place of honor. So what does the Rosary frame? The life, death, resurrection, and mysteries of Christ. The rosary in no way detracts from Jesus. Instead; it is meant to enhance the image, for a beautiful frame draws our attention to what has been framed and in doing so makes for an even more beautiful image. The rosary is a simple prayer. It is a prayer of prayers. Composed of the Sign of the Cross, which reminds us of our Baptism; Hail Mary – known as the Angelic Salutation; The Our Father, the prayer Christ taught us; The Doxology or Glory Be, which honors the everlasting nature of the Trinity; the Apostles’ Creed, which is the universal expression of belief of all Christian; and the Hail Holy Queen, which expresses Mary has the Mother of the Prince of Heaven. The first part is the words of the Angel Gabriel to Mary: Hail Mary Full of grace the Lord is with thee. These are heavenly words from the Angel Gabriel, words not of human origin. In its essence, it expresses Mary’s sinless nature, for Mary has been filled sometime in the past with God’s grace and we know that one cannot have God’s grace dwelling in the soul if one if full of any kind of sin. Also the salutation of the Angel attests to the fact that Mary, though fully human, has been chosen and was granted the special favor from God to be the mother of God made man. The second part is the words of Mary’s cousin Elizabeth: Blessed art thou amongst women, and blessed is the fruit of thy womb. By referring to both Mary and Jesus as ‘blessed’ it can be said that it again attests to both Mary’s and Jesus’ sinless natures as well as the intimate union between mother and Son. The third part is the divine name of the Son of God: Jesus. At the heart of the Hail Mary is Jesus. Jesus is the center and core of the mysteries of Christianity. No Jesus. No Rosary. The fourth part is when we ask Mary to intercede for us sinners in the name of Mother of God: Holy Mary Mother of God Pray for us sinners now and at the hour of our death. The title in Greek, Theotokos, is, according to Joslarv Pelikin a title through the ages unique to Mary the mother of Jesus. The Greek word for Mother of God can more rightly be translated as “God bearer,” and is not a statement about who Mary is but about who Jesus is. By calling Mary the “mother of God” we are in turn saying that Jesus was fully God and fully man from the moment He was conceived by the Holy Spirit. The final and fifth part of the Hail Mary is a simple and powerful word “Amen,” which translates into “so be it” or “Let it be.” Here we affirm what it is we have prayed. It is the plea of a child to his Father. Padre Pio, the famous Franciscian mystic who had the wounds of Christ, had the ability to read souls in the confessional, and a famous ability of bi-location (to be in more than one place at the same time) called the rosary his “weapon.” Drawing on a long history of knights, it became customary for knights to wear their swords on their left hand side, likewise, seen as a weapon, it became customary for monks and religious to wear the rosary on their left side. As it is a real weapon and the war they fight is not against people who pass away but against principalities. The Rosary, this is your weapon against the devil. You would be wise to use it. Only a fool would not raise a weapon to defend himself when attacked.